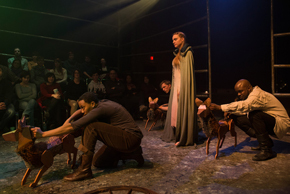 In The Hammer Trinity, Chris Mathews and Nathan Allen's Tolkeinesque three-part fantasy epic, there are two scenes where the entire audience rises in unison to cheer the action transpiring on stage. The villain getting his comeuppance is one, of course, but before that climactic victory, there is the moment where July of the Seven Foxes summons forth the animals of the kingdom to ride with her into battle. These include an eagle and a snake, the "warbler" birds who act as spies, the iron stag who rescues a lost prince at the start of the saga, and our heroine's own posse of vulpine consorts—every one of them operated by puppeteers assembled from the play's actors under the supervision of technicians from Part One (premiering in 2012) and Part Two (in 2013) productions. As with the anthropomorphic heroes of Julie Taymor's The Lion King and Handspring Puppet Company's War Horse, the birds and beasts of House Theater's mythic trilogy likewise transcend the restrictions of everyday marionettes to emerge as characters in their own right. Part One, in particular, features a blood-sport match between an eagle and a snake serving to showcase the contrasting movement of the wide-winged raptor as it swoops down on its prey, as well as that of the lissome reptile thrashing and darting in combat. "The snake is the only puppet that hasn't undergone any changes since 2012," says Lee Keenan, the original operator of the crawling combatant, "It has a canvas spine with circular wood segments running down its sides." Part Three puppet designer Jesse Mooney-Bullock notes that smaller versions of the snake can be found in souvenir shops at the zoo, but assistant designer Emily Breyer expresses hearty approval of the "great slithering sound" generated by the serpent's wooden body on the floor. Breyer is responsible for constructing the whole new eagle seen in Part Three, whose head is now mounted on a dowel permitting it to turn while airborne. Its wide wingspread mandated rehearsing the duel with spectators seated in the front rows to assess the boundaries of safety. "Joe Bianco, who operates the eagle, picked up on its personality immediately, so you can sense a visible dialogue in the fight." Breyer enthuses, "Did you notice how, in Part Three, the eagle soars to the front of the pack to lead the charge?" 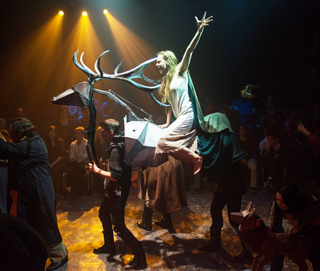 The deer that July rides was introduced in 2012 as the woodland creature who carries away the royal child in its antlers, but now sports a sturdy sedan-chair body resting on the shoulders of its two puppeteers to distribute its weight between them. The stars of the show, though, are the two dragons—Irek Obsidian, who appears as a giant head speaking from the shadows of his lair through all three chapters, and Hap the Golden, who assumes his saurian visage only in part three. House Theatre's Nutcracker was the first to utilize an outsized mask to represent the terrifying Rat King, but as Keenan notes, "The Rat King is a very different kind of animal. One thing we learned from making it, however, is that lighted eyes add a lot of life to large-scale puppets. They look wonderful in the dark, and they lend focus and energy to the face. We've had three Irek Obsidians made by three different designers, but that's remained constant." Playgoers are briefly allowed to pet the foxes in the course of the play, but past experience with make-believe animals in small spaces attests to children and adults alike finding themselves unable to resist the temptation to touch and grab. Keenan reports no problem yet, "The foxes are friendly, but the other puppets have an eerie otherworldly quality that makes audiences keep their distance," but Breyer recalls bringing some of the Hammer menagerie to the family-oriented "Puppet Zoo" in Hyde Park during the recent International Puppet Festival. "I let a little girl fly one of the warblers around the atrium for a few minutes, but then I had to search for her in the crowd in order to retrieve it. If I hadn't found her, she would have taken it home with her." Breyer shrugs and sighs, "It's so easy to become attached to a puppet." The Hammer Trinity runs at the Chopin Theater through May 3.